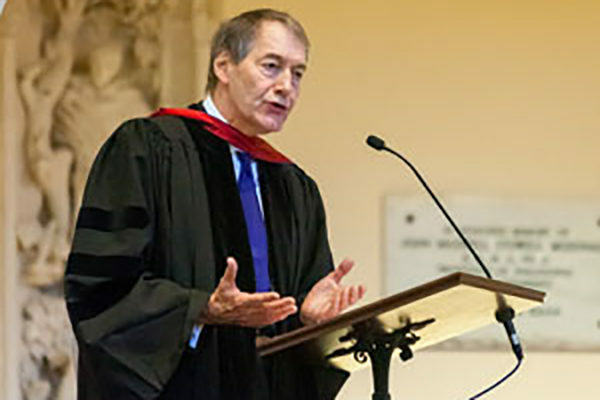 [Episcopal News Service] Top administrators and faculty members at Sewanee: The University of the South are recommending that the university rescind journalist Charlie Rose’s honorary degree in the aftermath of a sexual harassment scandal, and they are pushing for new procedures to guide reconsideration of such degrees after they have been awarded. The University Senate – which includes the vice chancellor, provost, chaplain, deans and all full professors – voted unanimously Feb. 26 to approve an advisory motion asking Sewanee’s Board of Regents to revoke Rose’s honorary degree. The regents had decided earlier this month to let Rose keep the degree. No official statement was immediately available from the Board of Regents. A university spokeswoman said the regents may be called together at any time by the chair to consider the Senate’s motion. Students, faculty, and alumni gathered in the Quad today to protest the Board of Regents’ decision not to revoke Charlie Rose’s honorary degree—and many removed their gowns at the steps of All Saints Cathedral to physically vocalize their protest. Story coming soon on our website. Photos by Matt Hembree (C’20). Complaints about the regents’ inaction escalated into a protest on campus Feb. 22 that reportedly drew more than 200 people. On Feb. 27, Vice Chancellor John McCardell Jr., in announcing the Senate’s actions, affirmed the university’s stance “against sexual misconduct of any sort on campus and in the workplace,” and he alluded to the growing controversy over the university’s lack of action against Rose. Rose, known for his work as host of “Charlie Rose” on PBS and Bloomberg and co-anchor on “CBS This Morning,” was dropped in November by all three broadcasters after the Washington Post reported on eight women’s allegations that Rose had made unwanted sexual advances toward them, including lewd comments, groping and walking around naked in their presence. Rose issued an apology for his “inappropriate behavior” and admitted he had “behaved insensitively at times,” though he also disputed the accuracy of some of the allegations. He was one of a series of prominent men from the world of entertainment, media and politics to suddenly fall from grace last year amid allegations of sexual misconduct. A complication in the debate, as McCardell noted in his statement, is that the university doesn’t have a clear process for reconsidering an honorary degree. The University Senate, which has the power to recommend individuals to be honored, also voted on Feb. 26 to instruct its Honorary Degree Committee to draft procedures that can be discussed and acted upon. “As a result, there will be a process, where none had existed, for the orderly review of an honorary degree once awarded,” McCardell said. That process, too, will need to be approved by the Board of Regents before taking effect. Four Episcopal bishops and three Episcopal priests sit on the 20-member Board of Regents, including Florida Bishop Samuel Howard, who serves as an ex officio board member because of his position as Sewanee chancellor. There should be no question where the university and the church stand. In order to “demonstrate in symbol and in substance that it respects the dignity of every human being,” The Board of Regents will, so many of us hope, act on the Senate’s recommendation. This should be a “no brainer”. Charlie Rose’s Honorary Degree should be revoked/rescinded immediately. If policy needs to be enacted, then it too needs to be put in place post haste. The comments are mine and do not necessarily reflect the opinion of the vestry nor the parish. NONONONONONONO. What is wrong with us that we can’t forgive. Ye who is without sin cast the first stone. Honestly! Really! The man has done so much for the world. We cannot discount his contributions. I am an abused woman–by clergy and others and continue to be stalked by an old boyfriend that I haven’t seen in 50 years. I have a Me too standing here. And I object to the way men have become targets. I don’t doubt he did these things. I don’t doubt that he feels some remorse. I don’t doubt the women but to make it like he never did anything for God or for education or for the planet or for anyone is just as bad. Father forgive me for not being as understanding as I could be towards those who I have hurt in the past–including almost every member of my own family. I don’t have a website nor a blog but I do stand for Christ in Lent. Don’t be tempted to be holier than . . .
What’s up this is a no brainer. I don’t agree with Dr. Stan Lightner who every he is. I’ve eaten Owenboro barbecue mutton! I’ve had it in California and in Cincinnati Ohio and in Owensboro. I’m practically a native. give me a break! I agree with Dianne Delaney. I’m disappointed in The University of the South.